In the busy-ness of life, remember to take time for your spiritual needs as well as physical ones. Blessings! 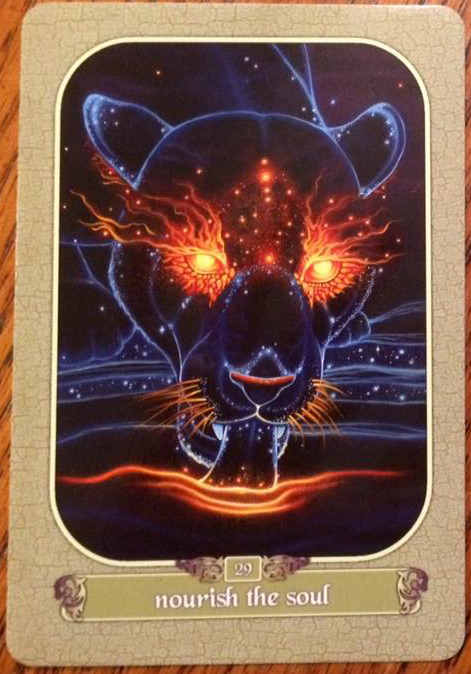 As suggested by this card on the day, as the moon is waning, we begin to fall away from the craziness that tends to surround the full moon and start to go within. What does this mean for you? Three quarters of Gaia’s surface is covered in water and the Moon’s pull can lift the Earth’s oceans at the Equator and carry them along in her wake. Two thirds of the human body is also water, therefore you also are subject to her power. As she waxes and wanes, so do you. Take note. Follow the moon cycles and take note of how you think and feel as her light increases and decreases. Take time to explore and understand her influence upon both your body and your emotions. I always love this card, but nature and the Fae are always welcome to me (even though they both demand respect and some caution mixed with the joy). Also, the Spirit of Water was a close second in today’s spread, so trust your intuition or be prepared for emotional healing. Blessings! Meaning: Joy, the light, peaks of carefree abandon. Living wildly, magically, and free. Be open to the wonders of the universe flooding into your life. Innocence and delight are abounding. Happiness is on its way! Native Spirit Wisdom: Almost every indigenous culture recounts stories of fairies, often called little people, and nature spirits. Although some of the fairies act in protection of their wildlands and should be treated with care and respect, most often they bring blessings and light to all in the room. 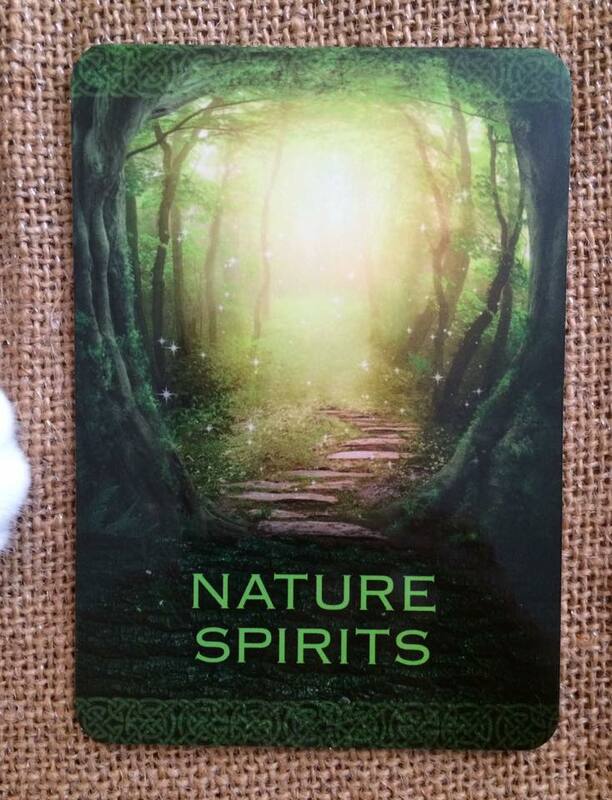 If this Nature Spirit card chooses you, then welcome to a wellspring of joy and magic. Beneath the surface, mystical interventions are occurring in your life. Relax. All is well. The Journey: Even taking a few moments of stillness in the natural world can help you attune to the world of the little people and nature spirits. If you see a small flash of light or a movement of a leaf on a windless day, these are often signs that the wee folk are near. New beginnings hopefully means more for us that the beginning of this week. Blessings! Meaning: Inspiration and enthusiasm. A new direction and purpose. The bringing o a new enterprise. Recent events bring the promise of brighter days to come. The instilling of hope, faith, and strength. Sensing one is on the destined path. The renewal of spirit and ambition. Following what seem to be good omens pointing the way. The card may also mean: Being given poor advice. Having to contend with armchair critics who underestimate one’s dedication and sill. A lack of support. Discouraging remarks fuel one’s determination. Card’s Story: Galahad drew Balin’s sword from the stone. After the death of Balin, the mastermind Merlin embedded the sword in a stone and set it to hover above the waters of a river. The stone held fast to the blade, designated to only release its grip when pulled by the knight who could achieve the Holy Grail. Over the years, the stone drifted downstream to arrive at Arthur’s court, where Merlin’s vision would come to pass. On the feat of Pentecost, a great marvel befell the court. A squire reported to Arthur that a stone of red marble had appeared in the river below, k and embedded in the stone was an ornate sword. Arthur gathered the Fellowship and went to see for h himself. Lanceblot beheld the sword, then called his kind aside. He then went on the explain to Arthur that when the rightful knight succeeded in pulling the sword from the stone, it would herald the beginning of the quest for the Holy Grail. Knowing he was not the destined knight, Lancelot refused to try to draw the sword. On Arthur’s bidding, both Gawain and Percivale tried their hand and failed. Having seen the “marvel,” Kay urged all to return to the hall to dine. As they sat down, the shutters and doors of the castle mysteriously shut by their own accord. There then appeared man of great age, and at his side a handsome young knight. The knight carried no sword or shield, only a scabbard. The old man introduced the young knight as Galahad the Desired Knight. Thereupon he led Galahad to his destined seat at the Round Table. Having done his duty, the old man then left the court. Suspecting that the Quest awaited this knight, Arthur led the newcomer to the river’s edge. On seeing the sword, Galahad knew the task to be his. The young knight looked to the heavens, then drew the sword as if nothing held it. He sheathed the blade within his scabbard: the dawn of the Quest had come. Today’s card hits my household at a good time as some of us are starting new endeavors that stretch the comfort zones but promise some great things. Hope it’s a good one for you all, too! MEANING: by looking at the past, acknowledging our mistakes and learning from them, we grow and attain new wisdom. The future waits to be unfolded by our positive action as we become “The Eighth Vessel” and receive powerful rejuvenating energies of rebirth. 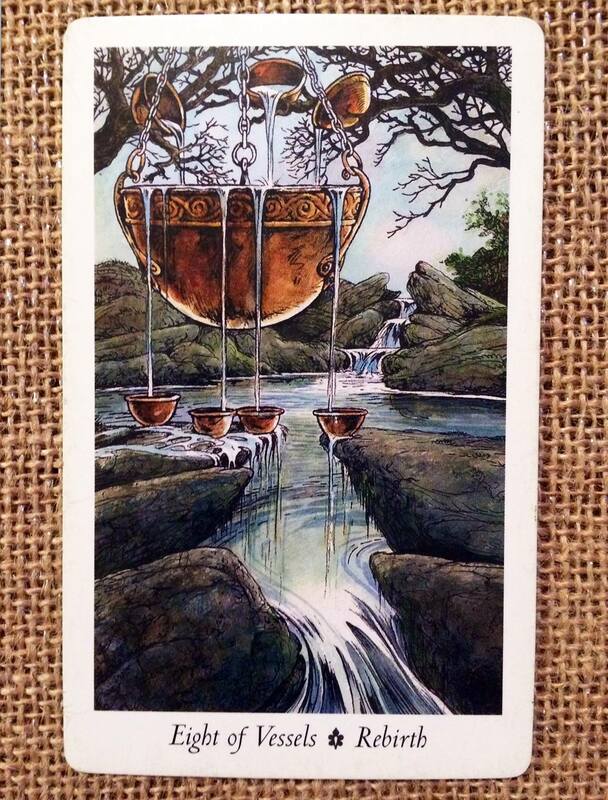 DESCRIPTION: From the middle of a fast-flowing stream, we see an ancient cauldron hanging form a great chain. In the trees above it are three smaller cauldrons. Water and energy flow from them, filling the great cauldron, which in turn overflows and fills four more, which sit on the rocks below and overflow into the stream. READING POINTS: Rejoice! A time of renewal and potential is here. The cycle of rebirth and healing brings inner peace and confidence. Once you accept that all the blessings and gifts of life can be yours or, indeed, already belong to you, the fear of asking is gone. It is time to shed the skin of the past and accept and utilize the overflowing potential of the present that is freely available to you. Do not be afraid to make mistakes. Do not be afraid to ask, “Why not me?” See potential where others only see barriers. See challenge as others see impossible odds. Apply all that you have learned through experience and toil to any problem and you will not fail. You have striven to survive and absorb insight; you have endured loss to retain your integrity. All of these trials have made you stronger, wiser, and more effective. Drink of this new fountain of opportunity and renew your life objectives. You have endured the past ¬– its gifts were hard won; now the challenge of the future unfolds. Grasp it and shape it in your hands as you would have it manifest in your life. The Wildwood Tarot by Mark Ryan and John Matthews, art by Will Worthington. 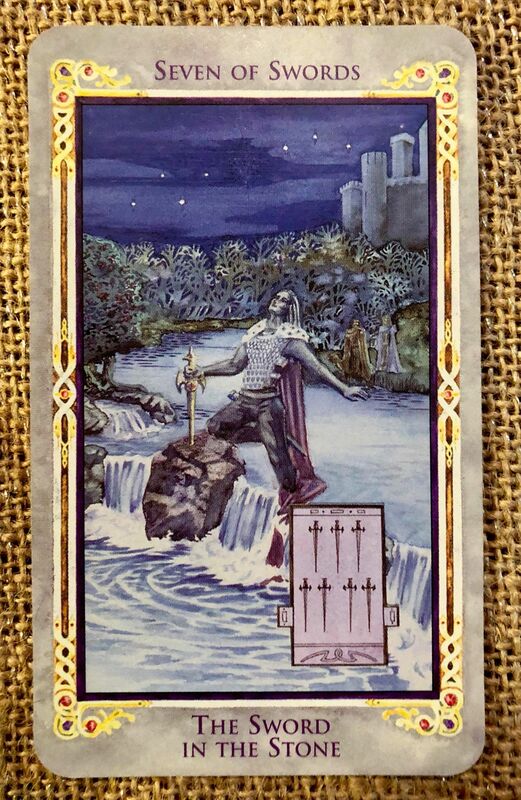 So, I was listening to a gorgeous guitar piece by Mexican classical musicians Rodrigo y Gabriela that was posted by a friend as I was shuffling the Halloween Oracle deck this morning. Then I drew this. Sometimes the universe conspires to bring you a certain beauty and magic for the day. I highly recommend listening to the video linked above – it’s gorgeous! 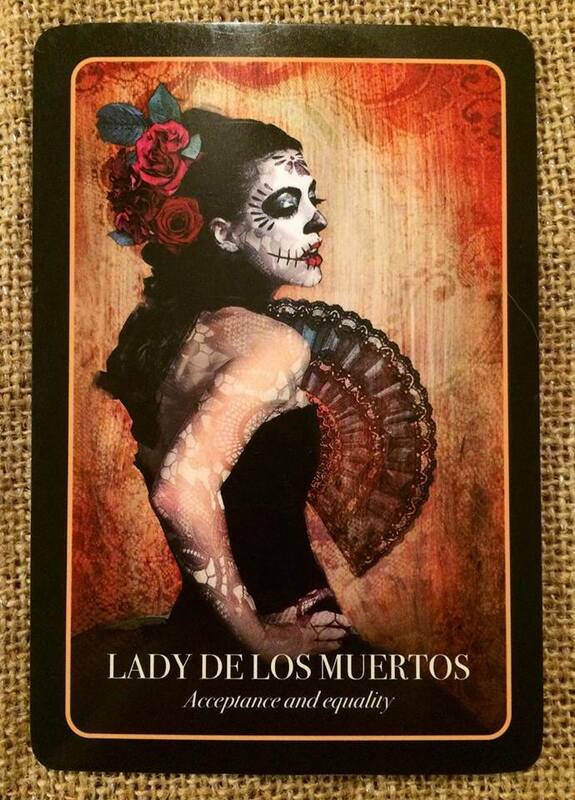 The iconic lady of death, with a pale skull-like face, zombie eyes and rich red funeral flowers in her hair has become one of the most recognizable symbols of Halloween and the Mexican Day of the Dead, El Dia de los Muertos. As they say, a goddess is a girl’s best friend. 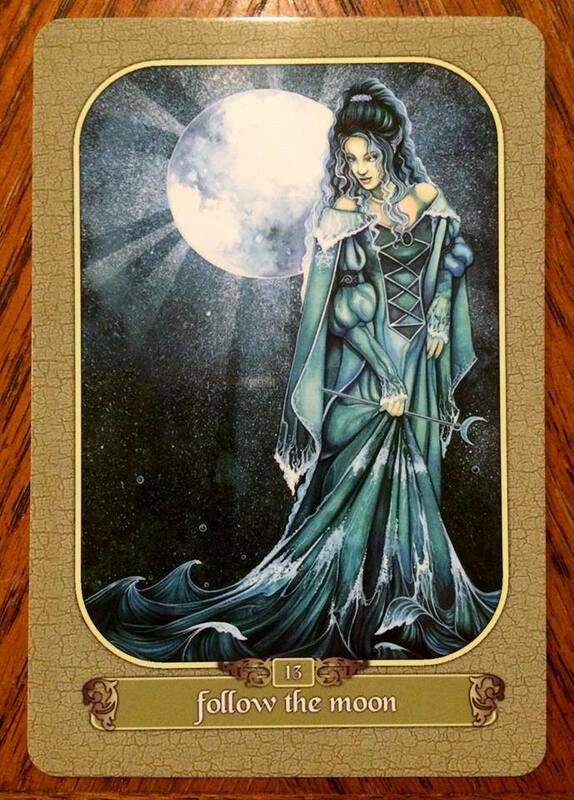 Yet this card is equally good for men and women – divine feminine works for both and for the Earth. Blessings! 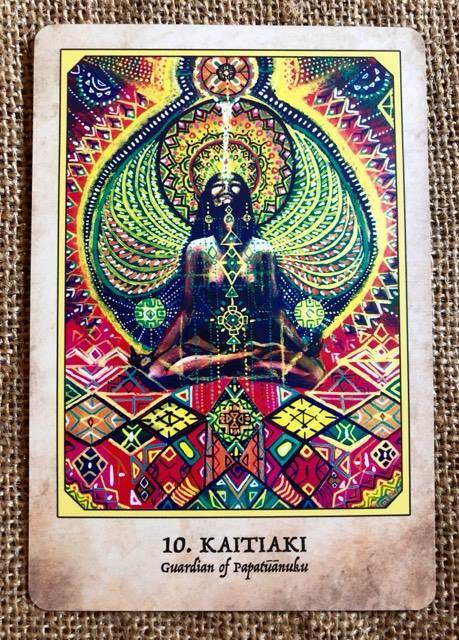 You are Kaitiaki, guardian of the Divine Feminine. Your relationship with Mother Earth, Papatuanuku, is sacred, empowering, and healing. You are destined to become more spiritually intimate with her, sharing in her creative potency and wisdom. Lean into her and trust in her support, even as you serve her by courageously voicing truth. She is your great ally, friend and healer, and as you dedicate yourself to her, she dedicates herself to you. Meaning: Make peace and let go of past issues around being abandoned or not understood or of feeling unsupported, as those experiences need no longer color your worldview. Trust that you belong here, and that your connection to the Earth Goddess will support you in all ways. You are sensitive, and rightly so. Never judge your sensitivity or feel that you are overreacting – but also allow nature to calm and soothe you, so that you can be focused on accomplishing your soul mission. If you feel that you are on your own, when you would like some help, allow the Divine Mother to be your friend and guide, while trusting that at the right moment, more allies will arrive. The Earth Mother has her own sense of timing, and you are not forgotten. You are just growing according to her wisdom and grace. Have faith in yourself and in her.